When I was a kid, I got thwacked in the face with a golf club. It was totally my fault. I was goofing around with my cousins (as one does) and failed to notice one of them winding up for a swing. Ended up with four stitches, the first one just half an inch from my left eye. Could have been a lot worse! There's something particularly uncomfortable about the idea of injuring your eyes. The infamous eyeball-slicing scene in Un Chien Andalou comes to mind. Immediate squirm fest. One of the more insidious types of eye injury occurs among people who spend a good chunk of their time looking into a furnace or fireplace without eye protection. Over the years, this slowly fries the front of their eyeballs. 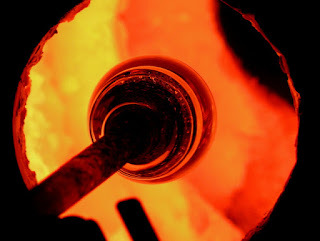 Eye-frying jobs include glassblowing, blacksmithing, and foundry work. People who work with a wood- or coal-heated stove to cook food or do laundry can also end up with eye damage. Heat (infrared radiation) is absorbed by the lens inside the eyeball, slowly transforming it from transparent to opaque. A clouded lens is known as a cataract. It's a problem because light has to pass through the lens in order to be detected by the retina at the back of the eyeball and converted into an image. Heat is also absorbed by the iris (the coloured part of the eye) and subsequently transmitted to the lens, furthering the clouding process. In a scientific article published in 1921, the authors talked about cataracts among the inhabitants of Cradley Heath. This town, located in western central England, was THE place to be if you wanted some chain. Several thousand people worked the chain trade there. Although chainmaking machines were available at the time, they couldn't yet compete with the ability (and cost, presumably) of a skilled chainmaker. Making chains by hand involves a lot of staring at hot objects, be it the fire in which you heat a piece of iron or the resulting white-hot metal you hammer into shape on an anvil. Workers in 1921 did not usually wear eye protection, so they fried their eyeballs and often ended up with cataracts. It was common knowledge if you made chains for a living your sight would probably fail after the age of 50. In conclusion, if you spend a lot of time gazing at fires, consider wearing eye protection. Coincidentally I had cataract surgery last week. I haven't been blowing glass nor forging chain, just sitting at a computer monitor for 40 years - which may have nothing to do with clouding my eyes. Cataract surgery is brilliant, as is my vision now (though the ability to change focus from far to near is gone, of course) and the new lenses in my eyes filter out harmful IR and UV radiation. Look after your eyes, folks, but if you get cataracts don't hesitate to get them fixed. The surgery (micro surgery) is incredibly fast, pain free, and wonderfully effective.